Creating an event is easy, but finding a time that works for everyone is sometimes tricky and time consuming. To make this easier and save you time, we’ve added a new 'Suggested times' feature to Google Calendar. 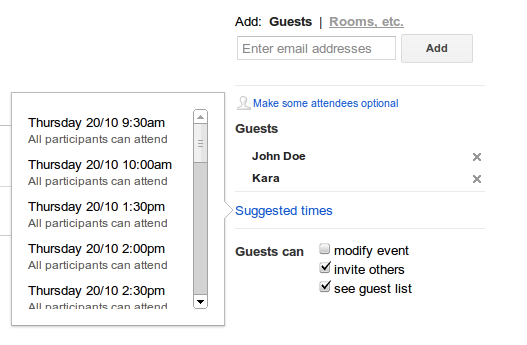 To get started, create a calendar event, add guests and click Suggested times. The resulting list will include upcoming times where all participants are available. For example if you want to create an hour long meeting with Kara, and she already has an hour long meeting at 3pm, then times like 2pm and 4pm will be suggested. As part of our ongoing commitment to accessibility, the list can also be navigated using the arrow keys and is accessible with a screen reader.